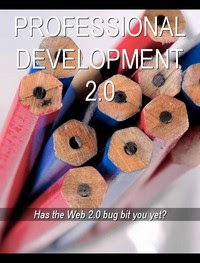 The IPA Research Blog: Professional Development 2.0: Has the Web 2.0 bug bit you yet? Anyone interested in learning and information technologies has most likely heard or read something about the ubiquitous Web 2.0 mantra. What is Web 2.0? If you type the term in Google search it will return the following list of definitions. a term introduced in 2004 to characterize design patterns in a constellation of new generation Web applications which may provide an infrastructure for more dynamic user participation, social interaction and collaboration. You can also find definitions in almost every other language (e.g. Chinese, Dutch, French, Portuguese, Spanish, Italian, German, etc.). The interesting thing about this technological phenomenon is the increased demand to use Web 2.0 concepts in new creative and innovate ways. Wikis, blogs, interactive websites (facebook, my space, YouTube, etc. ), multimedia, widgets, podcasts and videocasts are some tools that have emerged on the seen. Take an evening stroll on the web for an hour and you are bound to run into one or more websites that are using some form of Web 2.0 technology. Everyone from kids, teachers, internet enthusiasts, gurus, and techno geeks have a website, blogsite, or some other interesting forum that uses Web 2.0 technology. New terms such as Learning 2.0, Enterprise 2.0, and eLearning 2.0 have even emerged on the seen. Read the eLearning Technology Blog. Everyone seems to have gotten bit by the Web 2.0 bug. Recently, I too was bitten. In fact, I decided to create a new wikizine entitled Professional Development 2.0. This is my creative, innovative, and audacious way of getting others excited about expanding and using Web 2.0 technologies to promote a common, age old subject to make it more vibrant, motivative, and empowering. The Professional Development 2.0 wikizine focuses on next generation measurement methodologies, tools, and resources for professionals, employers, and educators to measure, score, monitor, and control individual performance assessments for career planning, professional development, recruitment, selection, placement, and counseling. The wikizine will also provide tips and tricks, articles, how to tutorials, demonstrations, and self help documentation to empower professionals as they plan, design, develop, and deploy learning strategies to enable personal and professional development. It is my hope that this new term will become a rich catch phrase that will spawn some interesting dialog, creativity, and innovation toward reinvigorating and motivating others to use Web 2.0 technologies as an integral part of their personal and professional development activities.